Riding on the backs of their defense, the Calgary Roughnecks defeated the Vancouver Warriors 8-5 on Saturday at Scotiabank Saddledome and in the process captured the season series between the two clubs. The Roughnecks’ win brought an end to a three-game losing skid and moves the club into second place in the Western Conference with a record of 4-4. After scoring four times in the first quarter, the Warriors’ offense was suffocated by a gritty and determined Calgary defense. Vancouver would go 38 scoreless minutes before Mitch Jones tallied their final goal of the night at 3:18 of the fourth quarter. Despite being down 4-2 after the first quarter, Calgary chipped away at the Vancouver lead in a physical affair. The Riggers scored once in the second, twice in the third and then put the game away with three goals in the final quarter. Calgary got a vintage performance from Curtis Dickson who netted the hat trick for the home team. Dickson used an array of sidearm and sub-shots to beat Eric Penney, but after the game, he too was quick to praise the defense. “Eight goals isn’t going to win you a ton of games in this league, but when our defense and goaltending play the way they did tonight, and for the last three and a half quarters there, it was nothing short of spectacular. We have them to thank for tonight,” Dickson said. Calgary’s faceoff team has been proving to be a real strength of this club. Not only is Tyler Burton one of the best faceoff men in the league, their entire group is competing and winning a large number of loose-ball scrambles. Interestingly enough, Calgary’s coaching staff has been putting together some neat schemes to get loose-ball vacuum Zach Currier freed up in these situations. Currier once again led all players with 12 loose balls on the night, bringing his season total to 82 – good for second place in the league. On most nights, allowing only eight goals would get you a victory in the NLL, but unfortunately for Chris Gill’s squad they couldn’t muster up enough offense to get the job done. Despite jumping out to an early 3-0 lead, something went wrong for Vancouver and they couldn’t adjust to Calgary’s defense. Mitch Jones and Logan Schuss led Vancouver with five and three points respectively. Jordan McBride continued his nice season adding a goal and an assist. For the second straight game, Eric Penney shone in the Warrior net. 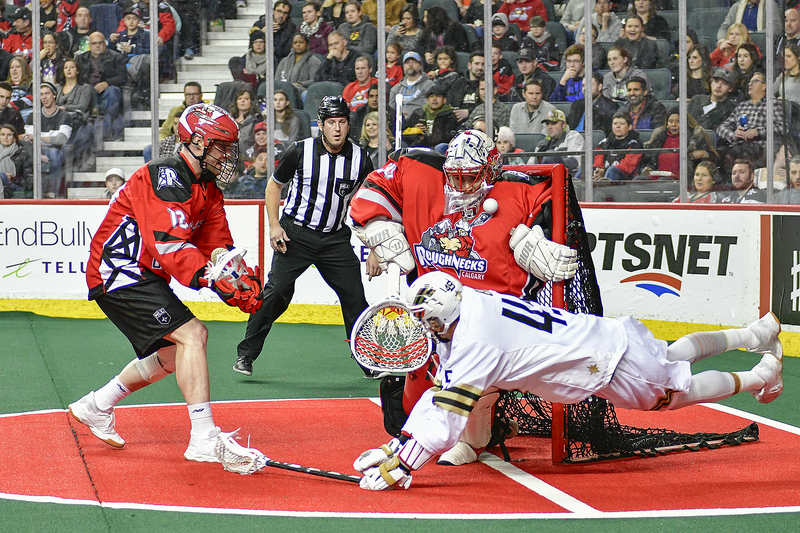 Penney stymied the Roughnecks’ attack, especially in the first half, and finished with 42 saves on 50 shots. Veteran Ian Hawksbee scooped 10 loose balls while Captain Matt Beers had eight loosies and one caused turnover. Christian Del Bianco shook off the previous three games and put together an amazing performance between the pipes. With the game in the balance, Del Bianco was particularly impressive in stopping Vancouver’s crease diving shots. The 5”10 goaltender seemed a step ahead of the Warriors’ shooters and was able to get some part of his body in front of the ball. Del Bianco turned aside 35 of 40 shots and also put together two shutout quarters on his way to earning the victory. Veterans Dane Dobbie and Rhys Duch led Calgary’s attack. Dobbie finished with a goal and four assists, while Duch went two and two. Fittingly, it was defender Mitch Wilde that scored the eventual game winner on an absolute bullet shot that beat Penney low. On Friday, Vancouver (2-5) will travel to San Diego to take on the Western Division leading Seals (4-2). Meanwhile Calgary (4-4) will also hit the road to visit Saskatoon for a game against the Rush (3-3).